From left: Mr. Kevin Yeap (Country Manager of Callaway Golf Malaysia), Mr. Takao Kurashima (Senior Director of Sales & Business Planning of Callaway Golf Japan), Mr. Vidur Kumar (Key Account Manager for SEA Distributor Callaway India) and Mr. Go Sugimoto (Planner, Business Planning, Callaway Golf Japan). 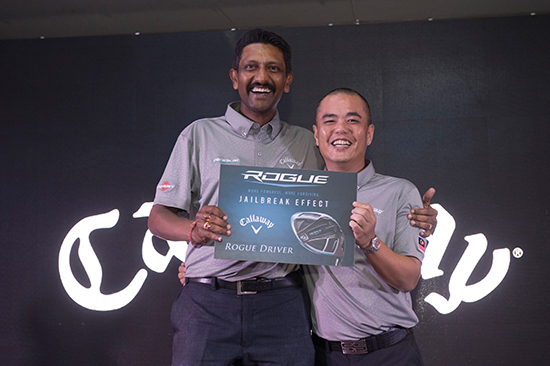 Shah Alam, 9 April 2018: Callaway Golf Malaysia through Leonian Singapore recently played host again to Callaway’s biggest South East Asia (SEA) unveiling of the ROGUE series, New Chrome Soft Series Golf Balls and the latest Odyssey putters at the award winning Kota Permai Golf & Country Club (KPGCC) on April 5, 2018. 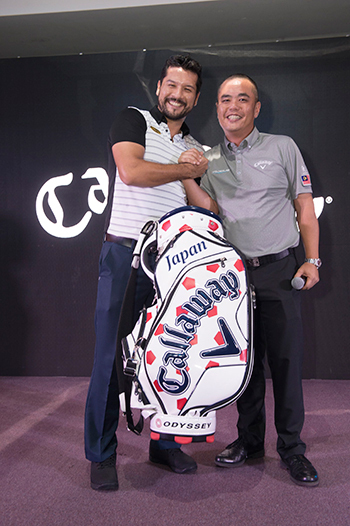 Dealers, business partners and staff of Callaway from across the SEA graced the launch as well as invited guest and media. Mr. Kevin Yeap, Country Manager of Callaway Golf Malaysia welcomed all that was present in an opening address, expressing his heartfelt appreciation to the entire local guest and media as well as those whom had came all the way from Vietnam, Philippines, Thailand, Indonesia and Singapore. Right after which Mr. Takao Kurashima, Senior Director of Sales & Business Planning of Callaway Golf Japan opened the launch with an impressive unveiling gimmick of the ROGUE followed by an in depth introductory to the advantages of the ROGUE series and Chrome Soft Series Golf Balls along with new line extension of the Odyssey putters by Mr. Vidur Kumar, Key Account Manager for SEA Distributor Callaway India. After the presentation, all invited dealers, business partners, guest and media were ushered to the driving range for the clubs demonstration, where all had the first hand opportunity in trying out the ROGUE for themselves. Taking place at the same time was also the Novelty Challenge consisting of the Longest Drive using the ROGUE Drivers and Speed Putting using the new extension line of Odyssey putters. The Longest Drive Challenge was made possible with the support of Trackman Golf where Mr. Justin Fong, SEA Sales Manager of Trackman Golf spearheaded the Longest Drive Challenge making every drive count for the participants. 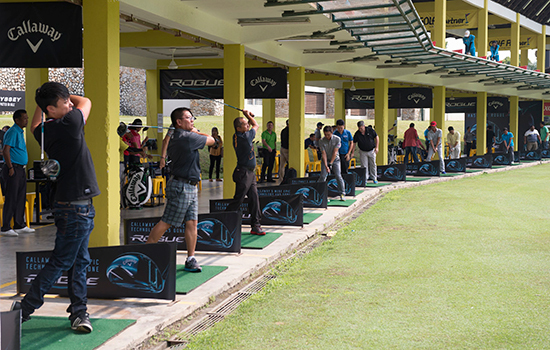 Each participant were given three (3) tries at the prepared bays to strike their longest drive using the three (3) options of ROGUE drivers (Rouge Standard, Rogue Sub Zero & Rogue Star). Participants were split to two (2) categories consisting of business partners or dealers and media or guest category. Whereas the Speed Putting Challenge took place at the practice green of the driving range, same as the longest drive, the putting challenge was also split into the same two (2) categories. Participants were required to use the new Odyssey putters that were prepared for the demo and was required to hole as many possible putts within the 30 seconds time frame. At the end of the demo and challenges at the range, all participants were ushered back to the main ballroom for pre dinner drinks and followed thereafter by a sumptuous buffet dinner. As the evening went on with good camaraderie, the master of ceremony got the night rolling with the first session of the lucky draw. There were lucky draw prize given to almost everyone who attended the launch and followed by the prize presentation of the Novelty Challenge that took place at the driving range earlier. 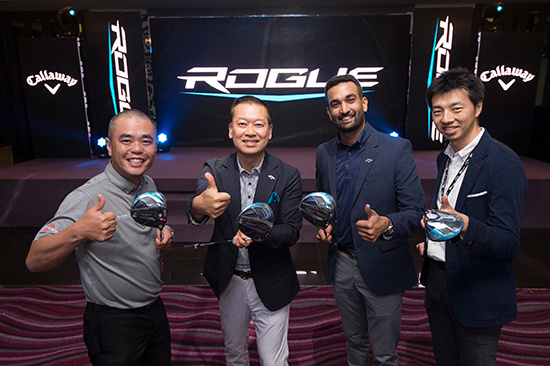 Henry Ong from Malaysia clinched the Longest Drive Challenge for the business partner’s category with a distance of 301 meters making him a honored owner of a new ROGUE Driver, followed by second placing Pierre-Jacques Roux at 294 meters winning a ROUGE Fairway Wood himself and Luke Reuter at 290 meters with a ROGUE Hybrid at third place. The media/guest category longest drive title was closed by Wutti Anutarachotikun from Thailand with a driving distance of 291 meters followed by George Wee at 286 meters and Razlan Alias at 272 meters taking home with them the new ROGUE series as well. As for the Speed Putting Challenge, Mr. Plandanday Muniandy arosed the Champion for holing in 7 putts in the Business partner category followed by V.Singam who was 1 putt short of Palani and Geronne Nore coming in third winning on count back with 5 putts. 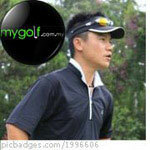 Mr. Saharudin Kamarudin clinched the Media/Guest category putting Champion with 5 putts, one putt ahead of Wutti Anutarachotikun and Seehachet Saifon from Thailand coming in third with 3 putts winning on count back. Both the Champions were presented with the new Odyssey O Works Putter with the second and third placing receiving a Odyssey White Hot RX Putter and Odyssey White Hot Pro 2.0 Putter respectively. However the most awaited highlight for the evening was the grand lucky draw session, where four (4) main grand lucky draw prizes - a Callaway ROGUE driver, Fairway wood, Hybrid and ROGUE Star Irons was awaiting their lucky owners. 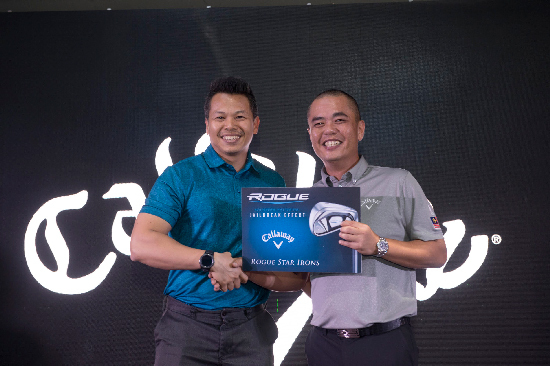 The first grand lucky winner of the evening was Goh Kok Liang winning himself a ROGUE Hybrid whereas Chonnakan Reanthong from Thailand was the new owner of the ROGUE Fairway Wood. The last two final grand lucky prize went to Mr. Sasikumar and Supakji Hantanawanich winning themselves a ROUGE Driver and ROGUE Star Irons respectively, there were indeed the envy of many that evening. A special surprise was also in store when Callaway Golf had decided to celebrate a guest birthday that coincides with the launch, Mr. Ken Kudo from Saujana Golf & Country Club was indeed flabbergasted when Callaway Golf Malaysia Country Manager Mr. Kevin Yeap, presented him with a special edition Tour Bag from Japan as a birthday gift. The evening ended on a high note with everyone leaving the ballroom with immense smiles and excitement on their faces as they had all definitely been ROGUED!